Can Tho (VNA) – The Food and Agriculture Organisation of the United Nations (FAO) will continue accompanying Vietnam and supporting the country to implement underway programmes and projects, Assistant Director-General and FAO Regional Representative for Asia and the Pacific Kundhavi Kadiresan has said. She made the affirmation at a meeting with Deputy Minister of Agriculture and Rural Development Le Quoc Doanh in the Mekong Delta city of Can Tho on August 24 on the sidelines of the 2017 APEC Food Security Week and a High-Level Policy Dialogue on enhancing food security and sustainable agriculture in response to climate change. Kadiresan said the FAO will help Vietnam carry out a programme on reduction of greenhouse gas emissions and forest loss and degradation along with integrated nutrition and food security strategies for children and vulnerable groups. 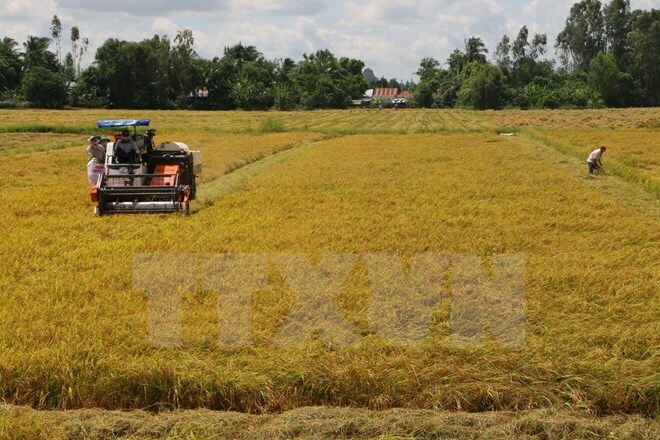 The UN organisation also pledged to assist Vietnam in promoting the intensive rice cultivation system in the Mekong River’s lower part in addition to enhancing monitoring and management capacity of information on diseases, building solutions to the sustainable provision of food for tra fish, and supporting the research of hi-tech agricultural models that are adaptive to climate change, she affirmed. Deputy Minister Doanh said Vietnam’s agricultural sector is focusing on two major targets, which are increasing the competitiveness for deeper global integration, and coping with climate change. Vietnam hopes to cooperate with international organisations and partners, especially the FAO, in experience sharing, technology transfer, and trade and investment promotion. The Southeast Asian country proposed the FAO provide technical assistance and help to access international funds to tackle climate change, reduce natural disaster risks for the domestic agriculture, and implement a national programme on agricultural restructuring and rural development. As the country’s northern mountainous region is bearing brunt of floods and extreme weather patterns, Vietnam hopes the FAO will support her to implement the “Zero Hunger” programme, build the Technical Cooperation Programme (TCP), and realise the comprehensive strategies on green growth and poverty reduction in the 2018-2019 fiscal year to help locals apply effective cultivation methods to deal with climate change and ensure food security, Doanh said. Vietnam called on the FAO to join her in a scheme to mobilise non-refundable capital from the Green Climate Fund to implement the action strategy of Reducing Emissions from Deforestation and Forest Degradation (REDD ) in the Central Highlands and shift the cultivation of rice in the Mekong Delta to other crops that are resistant to climate change, he added.